KEYRUS | O2O Commerce in France: which models allow physical sales and digital ones to complement each other well? O2O Commerce in France: which models allow physical sales and digital ones to complement each other well? The digitalization of commerce has been growing steadily for several years now, forcing retailers with physical points of sale (known as brick & mortar) to reinvent themselves if they are to survive in the face of the web's booming pure players. Developing O2O (online to offline and offline to online) services is an appropriate way of addressing the era of omnichannel commerce, mobility and everything being connected. What are these new models and what benefits do they offer? Today, 87% of consumers look for information on e-Commerce sites before finalizing their purchases in their usual points of sale, whilst 32% will buy an item on the Internet as soon as they find that it is not on the shelves. Customers are now permanently connected (smartphones, tablets, connected objects, interactive terminals), making lasting and major changes to their habits : impulsive buying is becoming rarer, giving way to more considered purchases, with systematic comparisons with competing goods and services being made before reaching a decision. Despite this omnipresent digitalization of commerce, the revenue share of physical stores still remains well above that of e-Commerce sites. Moreover, the conversion rate is between 30% and 70% in physical outlets, whereas it plummets to between 1% and 3% on digital channels. This reality encourages retailers to develop online services that generate in-store traffic, and at the same time build on their main assets, namely their outlets and sales teams. O2O services address these challenges and can be defined in two ways which are reversed but complementary : attracting internet users with online services to then lead them towards physical points of sale (online to offline), or offering them in-store services to direct them towards online buying (offline to online). In both cases, this type of service enables the retailer to move beyond the traditional division between the physical world and the virtual one and create a single form of commerce : connected commerce. This approach is all the more essential given that an omnichannel customer generally spends more than a classic customer in the store or one that buys only online. O2O services concern all stages of the purchasing process (pre-sale, sale, after-sale) and can take numerous forms, depending on the market. However, they have in common the fact that they all use digital innovations, notably mobile ones, to enable customers to move smoothly from one sales channel to another. In France, the three leading models are online purchasing with in-­store delivery (Click & Collect), online reservation with in-store services (Reserve & Collect), and finally e-Commerce purchasing terminals and tablets at the points of sale. This type of service has been particularly popularized in recent years by retailers like Fnac and by the "Drive" services proposed by supermarket chains. In concrete terms, it means that the customer places his order on a retailer's e-Commerce site and collects his product at his chosen point of sale. This approach may seem paradoxical, and yet in 2013 it was already appealing to 85% of the French (source: Ifop). The benefit for the customer is that he is able to take advantage of the ease and speed of online buying and the frequently lower prices it offers, whilst at the same time avoiding the constraints involved with having the product delivered, such as the often inconvenient time slots proposed by home delivery shippers. Paying no delivery costs is also a definite advantage, notably for grocery shopping, which supermarkets often charge a lot to deliver. With the Drive systems, the customer thus avoids the hassle of shopping (parking, queues...) whilst still limiting costs. As for other, more specialized retailers, like Fnac or Darty, they choose to offer 1-hour express in-store delivery, limiting even further the inconvenience of the delivery time for the customer, although he still has to make the effort to go to the store. In 2012, more than 22% of online orders were collected in-store in this way. Other retailers, such as Galeries Lafayette, offer to handle returns of online purchases in-store, which is a real plus for customers, since they no longer have to send the product back through the mail. This system obliges retailers to reorganize their stocks to meet demand, but they derive benefit from this by making the customer come to the store, since he very often ends up buying items that are in addition to, or that sometimes supplement, his initial purchase. Quite similar to Click & Collect in terms of the principle behind it, Reserve & Collect goes one step further in the services offered to the customer. As he spots products online, he is thus able to check the stocks at each of the retailer's points of sale (as proposed by Decathlon, the retailer specializing in sports goods), and when the products being ordered are in stock at several different outlets he can sometimes even request that the total order be grouped together for collection in one store. Certain retailers, like the toy specialists La Grande Récré, also offer the possibility of paying for the order not online, but in the store, when the reserved item is collected (ROPO : Research Online Purchase Offline). This allows the customer to examine the product in the store (and possibly to change his mind), but also to try it, as proposed by Galeries Lafayette for ready-to-wear clothing. Here again, the customer saves time and avoids both the inconveniences and cost of delivery, although some retailers offer these services only for purchases above a certain minimum amount and exclude commercial promotions (sales, private sales...). For the store, providing this type of service also requires that they adapt both the way they organize their stocks and their handling of returned and refunded products. However, by making customers come to the point of sale they are able to encourage those who are undecided to proceed to purchase by making payment in the store. Developing omnichannel commerce services also involves digitalizing sales outlets (Digital Store). By making e-Commerce solutions available actually inside the store, the latter can offer its customers products which are not stocked in the store, and therefore give them a wider catalog range. In the case of ready-to-wear clothing, this can be done for missing sizes or colors, or even for brands that are not available in the store, for example. For certain small shops lacking sizeable sales and storage space, offering this variety of products can be a real plus in attracting and satisfying customers. These solutions can take the form of interactive terminals or sales staff equipped with tablets. The latter can not only place online orders for customers but also have available additional product information. According to the 3rd annual barometer of the connected commerce experience (source: DigitasLBi/2014), 74% of the French think that sales staff would be more effective if they were equipped with tablets, proving that expectations in this area are high. The payment for an online order placed in the store can be made in several ways. Either it can be made in the normal manner like on an e-Commerce site, but directly on the terminal or tablet, which can turn out to be more laborious and less secure than paying from home; or it can be done by paying directly at the till, with the retailer ensuring that the online transaction is clear for the customer to see. This is the case, for example, with the King Jouet chain, which proposes to its customers to take an order ticket at an interactive terminal and to pay at the till, or alternatively to scan a code to complete the order on their mobile or from home. So it is that O2O services are developing and complementing one another more and more on the French market, enabling customers to enjoy a better in-store experience and retailers to generate growth in their revenues. Yet, France still remains hesitant about developing other O2O services that are already present on certain more digitalized markets, like, for example, China, where mobile commerce (m-Commerce) has become a real way of life, to the point where it accounts for 30% of all e-Commerce transactions. Although m-Commerce is starting to take off on the French market (+89% in 2015 according to a study by RetailMeNot), there is still major potential for growth in the use of mobile in O2O services. Technological platforms capable of ensuring the overall management of these services exist and provide solutions to these major challenges posed by today's commerce. 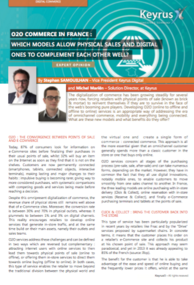 By Stephan Samouilhan, Vice President Keyrus Digital; and Michel Mariën, Customer Solutions Director Digital Commerce.